After an unexpected build in inventories was reported by API on Tuesday evening, the Department of Energy’s (DoE) weekly inventory report also showed that crude inventories swelled in the last week. While traders were expecting stockpiles to fall by 800K barrels, they actually increased by 2.5 million. That now puts total inventories 189 million (53%) above their historical average for this time of year dating back to 1983. 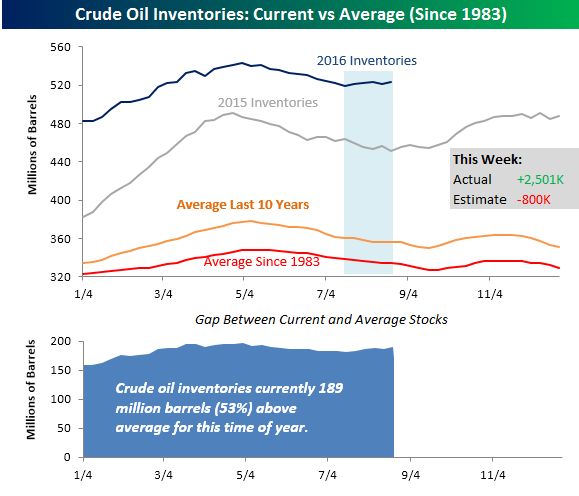 As shown in the chart below, since the middle of July (shaded box) crude oil inventories have risen by more than 4 million barrels. For this time of year, the 4.132 million barrel increase in inventories over the last five weeks has only been larger in six other years since 1983. 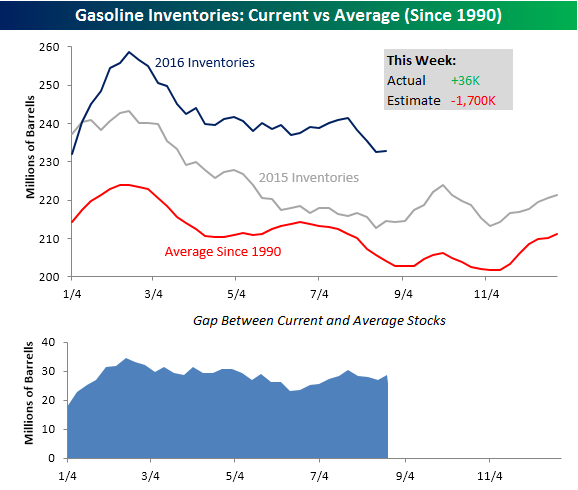 Like crude oil, gasoline inventories saw an unexpected build in stockpiles last week, but the build was not nearly as large. As shown in the chart below, gasoline stockpiles increased by 36K barrels compared to estimates for an increase of 1.7 million barrels. As the chart below shows, gasoline stockpiles remain well above their historical averages, but unlike crude oil, the pattern for gasoline has been following the seasonal pattern.